Depression is the leading cause of disability worldwide. It is estimated that in Australia, around 45 per cent of people will experience a mental health condition in their lifetime; in any one year, that’s around 1 million Australian adults suffering from depression (Beyond Blue 2015). Whilst there are many different types of depression, with symptoms ranging from minor to very severe, all forms are highly disabling and have an immeasurable impact on an individual’s life. Whilst depression itself has been researched for many, many years – new research has emerged alongside the growing popularity of Facebook: research regarding the link between depression and Facebook through harmful social comparisons. Dr Charlotte Rosalind Blease’s research article, ‘Too Many ‘Friends,’ Too Few ‘Likes’? Evolutionary Psychology and ‘Facebook Depression’, looks directly into this link to try to determine if Facebook can actually cause depression. Blease is completing her fellowship at the University College Dublin’s School of Philosophy. She has completed a PhD on philosophy of science and philosophy of mind, was a Postdoctoral Fellow at the Center for Mind, Brain and Cognitive Evolution in Germany and has also lectured in philosophy at Queen’s University, Belfast. She is clearly highly qualified to write on this subject, with a deep understanding of the science of psychology and depression. Blease uses up-to-date and diverse sources to initially lay down an understanding of both depression and Facebook separately before moving on to “survey the problematic and conflicting results in the empirical literature on the causal link between the use of social networking sites and depression” (p. 2) by objectively providing other viewpoints in comparison with her own. She then continues to discuss how Facebook could possibly cause depression, before concluding with some directions for future research, highlighting that social psychology and evolutionary cognitive science need to be integrated in order to fully understand the connection between social media and depression. 4. The content of the updates tends to a bragging nature. These findings might be of particular interest to academics and students working or studying in psychology, cognitive science or media and communications, as the report is quite scientific in nature, with an emphasis on the cognitive side of depression, rather than just Facebook use. From my perspective as a Facebook user, it is thought provoking to consider how what I post affects my ‘friends’ and vice versa. Blease’s well-structured, informative and interesting research article is a valuable contribution to the relatively new and rapidly expanding body of research regarding the cognitive effects that social media has on its users. Beyond Blue, 2015, The Facts, Beyond Blue, viewed 10 April 2015, <http://www.beyondblue.org.au/the-facts>. Blease, C. R. 2015, ‘Too many ‘friends,’ too few ‘likes’? Evolutionary psychology and ‘Facebook depression’’, Review of general psychology, vol. 19, no. 1, pp. 1 – 1. Thick Ethic Confusion: what is right and what is wrong? Ethics can be thought of as being common moral guidelines which are intended to help us differentiate between right and wrong (Tinkler, 2013). The BBC defines ethics as ‘a system of moral principles, affecting how people make their decision and lead their lives’. Ethics are important to ensure that people worldwide understand what is acceptable—to guarantee people adhere to standards that promote understanding and justice. But it is rarely that simple. With no fixed answers as to what is exactly right or wrong, ethics can be highly subjective. This is due to the fact that standards of ethics depend on various different factors such as ‘discipline, political system, legal system, religious/social system, research content, setting/institution and time in history’ (McCutcheon, 2015). Social media websites are increasingly being used as vast tools for research, opening up new opportunities for researchers. However, this new and rapidly expanding form of research tool has raised several challenges and concerns in regards to ethics. Social media websites have the ability to collect personal information from users when they set up an account – personal information including name, gender, age, location etc. As well as this, statistical information can also be collected through a person’s use of social media, such as their time of use, frequency of use, types of people and activities engaged with, which external links are clicked on, etc. etc. : pretty much anything a person does on social media can be seen, stored, analysed and utilised by social media analysts. But with this ability to track users come several ethical issues. One recent example where these ethical issues are clear is the experiment conducted by Kramer (Core Data Science Team, Facebook, Inc.), Guillory and Hancock (both from the Departments of Communication and Information Science, Cornell University). Facebook examined the experimental evidence of massive-scale emotional contagion through social networks with the intention to find out whether ‘emotional contagions’ affect the emotions of social media users – that is, whether the emotions of social media users and their content was contagious to other users. But, in order to conduct this experiment, the research team used filtering software which allowed the researchers to filter through user’s newsfeeds. Even though the filtering system was backed by Facebook’s Data Use Policy which every user had to agree to on creating an account (yeah, because everyone reads the 100000 page policy book and doesn’t just click ‘I agree’), it is the fact that the 689, 003 participants, chosen at random, had no idea that they were being a part of the study which raises ethical issues. There was absolutely no level of informed consent. This experiment has led to many concerns amongst the recent media research which features social media statistics. I definitely believe that any social media user should be directly informed if their activities are being watched and recorded for media research; even though I would be totally fine with my data being used, and I’m sure most people would also be, it is just the fact of knowing that I am being watched which would make the report much more ethical. Ethics are pretty much just a big subjective ball of confusion, with every person having a slightly different perspective on what is right or wrong. But regardless, it is clear that codes of ethics are definitely necessary in research in order to protect the rights and emotions of every human being. Kramer, A. D. I., Guillory, J. E. & Hancock, J. T. 2014, ‘Experimental evidence of massive-scale emotional contagion through social networks’, Proceedings of the National Academy of Sciences of the United States of America, vol. 111, no. 24, pp. 8788-8790. Tinkler, P 2013, ‘Ethical issues and legalities,’ Using photos in social and historical research, SAGE, London, pp. 195-208, viewed 29 March 2015, <https://tr.uow.edu.au/uow/file/01c8dc7c-27b0-419b-a25f-54edd7f10d5b/1/Ethical%20issues%20and%20legalities.pdf&gt>. Facebook envy: are our ‘friends’ making us depressed? With 1.393 billion monthly active users (Smith 2015), and an aim to “…give people the power to share and make the world more open and connected” (Facebook, 2015), it would seem ridiculous for people to log on to a website that actually invoked feelings of depression. However, since significant academic discussion exists regarding the negative emotional impact of Facebook, it is interesting to consider the question, ‘does Facebook make people depressed?’ This idea has been explored in the research conducted by Edson C. Tandoc Jr., Patrick Ferrucci & Margaret Duffy in their 2015 research report, ‘Facebook use, envy, and depression among college students: Is facebooking depressing?’ Tandoc is an Assistant Professor at the Wee Kim Wee School of Communication and Information at the Nanyang Technological University in Singapore, Ferrucci is an assistant professor in the Department of Communication at Bradley University and Duffy teaches courses in strategic communication, research methods and media management at the Missouri School of Journalism. All three authors are clearly highly qualified to write about this topic and each author has released other studies regarding similar topics. 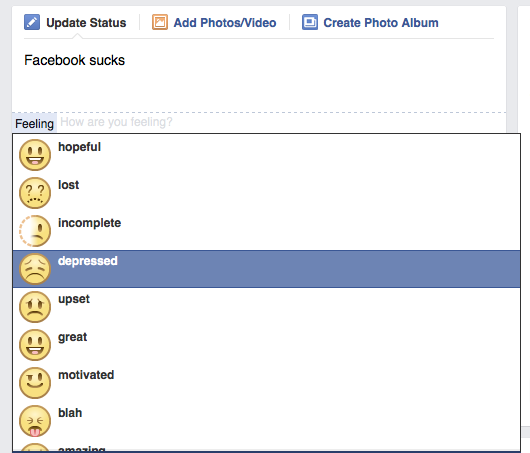 The text attempts to find a link between Facebook use and depression among college students. It ‘uses the framework of social rank theory of depression and conceptualizes Facebook envy as a possible link between Facebook surveillance use and depression’ (Tandoc et al., 2015, p. 139). The authors undertook a survey of 736 college students and found that Facebook can trigger feelings of envy, which, in turn, may lead to feelings of depression. 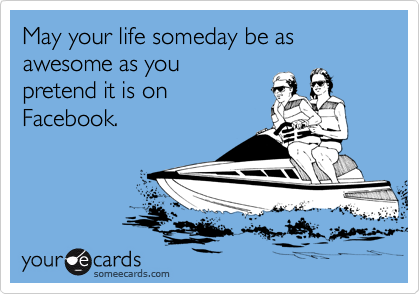 They found that college students who use Facebook heavily have higher levels of envy because they are exposed to a lot of personal information from their Facebook friends – friends who strive for a positive self-presentation by posting ‘successes, material goods, positive relationships, and other information that other users share on Facebook’ (Tandoc et al., 2015, p. 149). 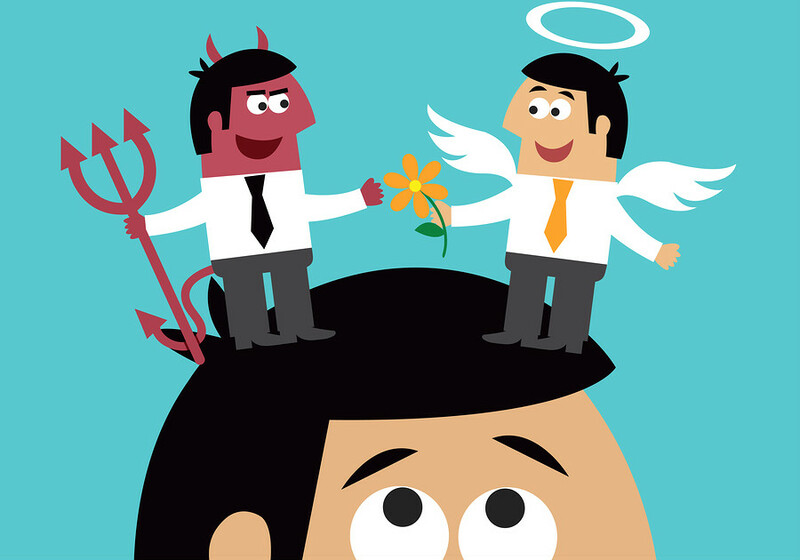 ‘Exposure to these pieces of positive information about others can lead to feelings of envy, as information consumers can feel subordinated to others who seem to publish positive experiences all the time. The irony, of course, is that users rarely post negative experiences, which might contradict the aim of positive self-presentation. Thus, when users feel envious constantly, they might develop depression symptoms over time.’ The authors’ findings were objectively backed up with reference to several other reports whilst also including references that opposed the authors’ hypothesis to provide a well-rounded, well-informed report. Tandoc et al. carried out an online survey that collected information by asking people a number of questions and coding their responses in numerical form suitable for statistical analysis. Within their survey they controlled a number of variables such as Facebook use, envy and depression by defining and specifying the terms. To survey feelings of depression, the authors used the Center for Epidemiologic Studies Depression Scale, one of the most commonly used measures of depression. The scale consists of 20 items asking questions about symptoms associated with depression. The report is well set out with headings and subheadings so the chronological experimental procedure can be easily seen and understood, from hypothesis and method to results and conclusion. Since Facebook is such a huge worldwide website, Tandoc et al.’s research into the possible negative mental impacts of Facebook use are of great significance to audiences globally – audiences such as academics and students undertaking study in the fields of psychology, behavioural sciences and media and communications, as well as users of Facebook and social media in general. As part of the intended audience, it is interesting to consciously consider whether something that I use every day is actually having a negative impact on my emotions. Additionally, Tandoc et al. suggest that the link between Facebook use and depression is only just starting to attract scholarly attention, but scholars still disagree on the nature of the relationship and so their research is important as it contributes to this growing area which could improve the lives of many people if there is, in fact, a link between Facebook and depression (p. 139). Facebook 2015, Facebook company mission, Facebook, United States, viewed 19 March 2015, <https://www.facebook.com/FacebookAU/info?tab=page_info&gt>. Smith, C 2015, How Many People Use 800+ of the Top Social Networks, Apps and Digital Services?, DMR Digital Marketing Ramblings, viewed 20 March 2015, <http://expandedramblings.com/index.php/resource-how-many-people-use-the-top-social-media/6/>. Tandoc, EC, Ferruci, P & Duffy, M 2015, ‘Facebook use, envy, and depression among college students: Is facebooking depressing?’, Computers in Human Behavior, vol. 43, pp. 139-146. The first blog of a subject is always the hardest, so admittedly I found myself opening a new safari tab on my phone with the brain-dead intention of Googling the word research. But, after looking at the amount of tabs I already had opened with various questions directed at Mr. Google and his endless pool of knowledge, it became obvious that I research a lot more than I had ever consciously realized. I had consulted Google on cheap flights, bushwalks in my area, the phases of the moon, and costumes to wear to an upcoming circus-themed 21st – all in the past few days. Whilst, these questions might’ve been burning and imperative to me for a couple of hours, they are in no way scholarly research, they are in fact everyday research: research that is unconscious and automatic. Scholarly research, however, is deliberate, it is ‘systematic and objective’, and it revolves around ‘correctness and truthfulness’ (Berger 2014). Scholarly research should be completely detached from our personal opinions, biases and experiences (McCutcheon 2015). No matter if the research falls into the category of everyday or scholarly, either way, when we pose these questions we search for answers that have been provided already, answers that we can add value to or answers that may not exist currently; we aim to establish facts and reach conclusions. Further than this, the research we undertake can fall under two categories: quantitative and qualitative. Quantitative research is about ‘asking people for their opinions in a structured way so that you can produce hard facts and statistics to guide you’ (Willis 2015). Qualitative Research is primarily exploratory research. It is used to gain an understanding of ‘underlying reasons, opinions, and motivations’ (Wyse 2011). 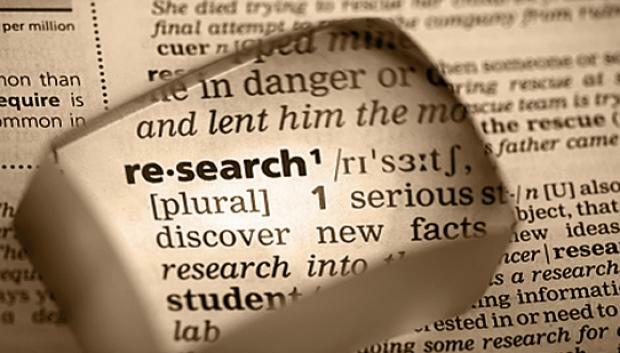 Both forms of research can be incorporated into finding a conclusion to an idea, however each have their own downfalls. Berger (2014) claims that quantitative research is accused of being too narrow; where as qualitative researchers are accused of reading into things that aren’t there.